He was tasked with conducting research into what networks might be missing from the northwest region and then producing a programme to address any gap identified. Over the course of several months, Peter interviewed artists, programmers and funders in the region. A summary of his findings is available for download here. 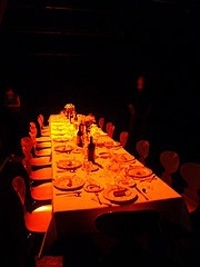 The resulting programme that was created is called The Sunday Lunch Club and it is a theatrical work-share and networking event for contemporary performance makers centered on a generous exchange of ideas over a delicious Sunday lunch. The event is currently invitation only with participants suggesting new members on a regular basis. Participating venues include Lanternhouse / National Creation Centre, Bluecoat Arts Centre, Greenroom, Nuffield Theatre Lancaster, Leeds Met Studio Theatre, Axis Theatre Crewe, UCLAN, and Rose Theatre Ormskirk. See www.proto-type.org for more information.